Wilder: I Will Retire From Boxing If Stiverne Wins Our Rematch! 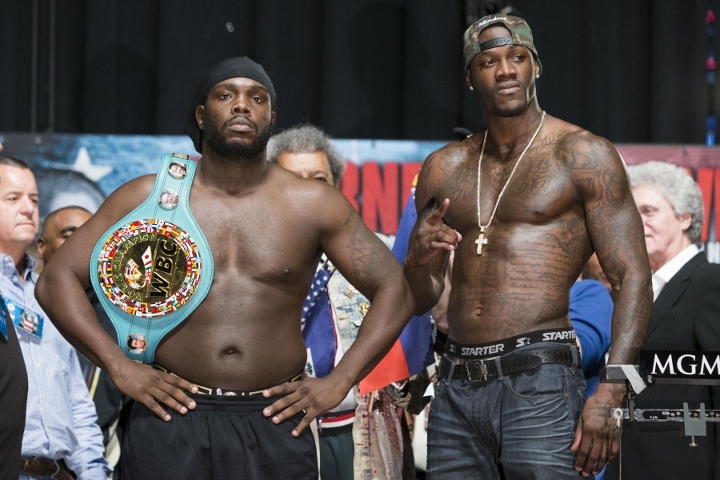 Deontay Wilder raised the stakes Tuesday for his rematch against Bermane Stiverne. The unbeaten WBC heavyweight champion promised during a conference call that he’ll retire if he loses to the former champion in their second fight November 4 at Barclays Center in Brooklyn. Stiverne is the only opponent Wilder hasn’t knocked out during his nine-year pro career, but Wilder won his title by defeating Stiverne relatively easily in their 12-round fight in January 2015. Wilder’s win nearly three years ago has made the Tuscaloosa, Alabama, native completely confident Stiverne can’t beat him in their rematch, so sure that he’ll walk away from boxing if he loses. “Y’all can quote me on this,” Wilder said. “Y’all can put this on paper. Y’all can put this at the top of the headlines, because the way I’m feeling about boxing right now, if Bermane Stiverne beats me I will retire. You can put that down. I will be out of the way. Boxing ain’t gotta worry about me no more [if I lose], because it ain’t really doing me no good anyway. Nobody don’t really wanna fight. Stiverne (25-2-1, 21 KOs) reiterated during the conference call Tuesday that he was “sick” when they fought the first time. Wilder (38-0, 37 KOs) dismissed Stiverene’s claim that dehydration hindered him when they fought at MGM Grand Garden Arena in Las Vegas and criticized the Haitian-born, Las Vegas-based contender for making excuses. The 32-year-old Wilder will make a mandatory title defense against Stiverne because his original opponent, Cuban southpaw Luis Ortiz (27-0, 23 KOs, 2 NC), tested positive for two banned substances last month. The WBC wouldn’t allow Wilder to fight Ortiz thereafter and ordered him to instead make his mandatory defense against Stiverne, who has fought just once since Wilder beat him. [QUOTE=Kigali;18160936]Let's say you're not.. The question still stands Who ya'll got??????? [/QUOTE] Define 'ya'll' for me please, i cannot locate the phrase in the Oxford Dictionary. Is it Ebonics? You say that because you know Stiverne is only fat and slow bum. But no matter, Joshua will retire you. [QUOTE=alexguiness;18160933]I am not Hispanic bro...for like the 100th time. [/QUOTE] Let's say you're not.. The question still stands Who ya'll got?????? ?